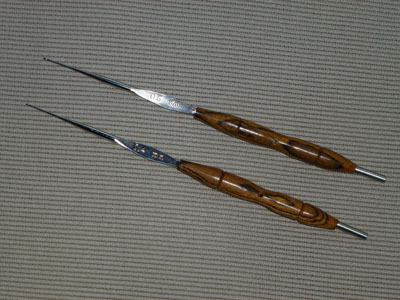 All our lace making tools are individually hand-turned and beeswax polished to order. If you would like any of these tools in a different wood than those listed here, then please contact us for availability. If you would like a different combination, then just ask. Each tool has a central hole, so it can be pinned to your pillow. 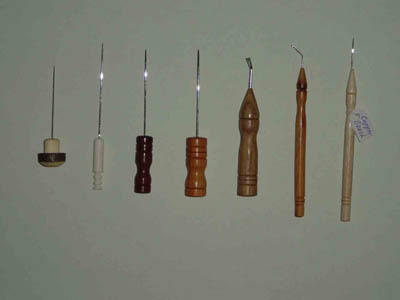 All our lace making tools are individually hand-turned and polished to order. 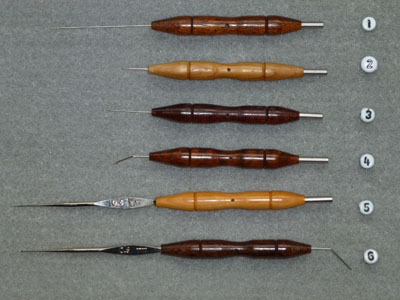 These tools are available in Bocote, Cocobolo, Yew, Karanda or African Blackwood, as a set or individually. When making a long length of lace, you will need to move your finished lace up. Rather than letting the lace "dangle" at the top end of pillow, it is rolled up onto a roll-up bar (which will keep it clean and flat without fold marks). 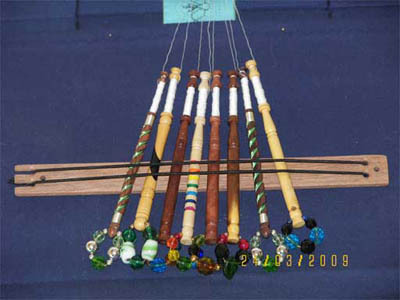 The roll-up bar is than secured to the lace pillow with long pins. The sample in the photo is approx. 110mm long, diameter 18mm and max. 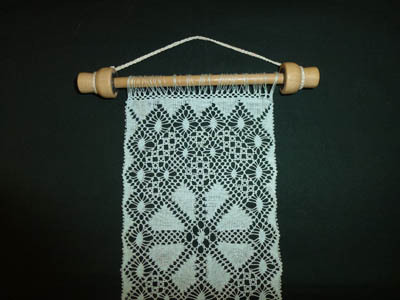 lace width would be 75mm. Different sizes can be made to order. Choose your wood from the wood list. 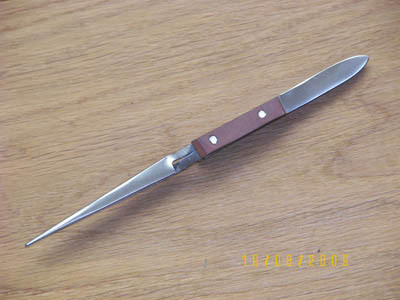 Very good for holding a broken thread on your pillow, whilst tying in or bringing in a new thread. Many uses for other crafters, jewellery makers, stamp collectors etc. Forged in stainless steel, and with insulated handles. 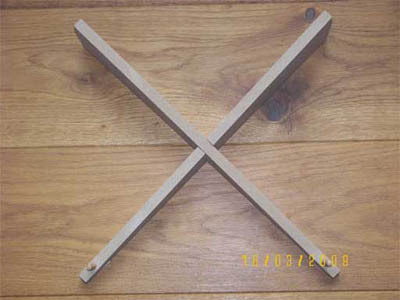 Solid dowel, which you thread through the bobbin spangles, and which will hold approx. 10/15/20 bobbins depending on length. 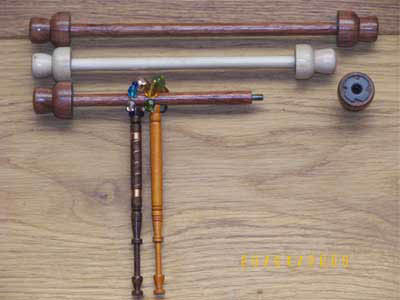 Both ends screw off, so the bobbins can be released on either side as needed. Quality metal parts ensure smooth operation and a long life, just do not overtighten them. 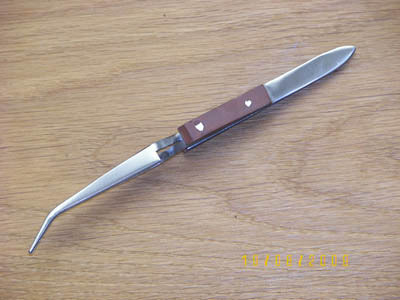 Available in Holly and Bubinga, and in three lengths 10/15/20cm. Note: Also great for wall hangings in lace, embroidery, etc. A good old design to hold bobbins out of the way, or during transport of your pillow. 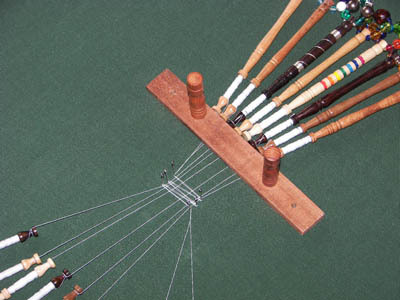 Lay bobbins over the wood, then secure with the elastic, and pin down at either or both ends to your pillow. Available in Walnut. Two parts slot together to make a safe pilow support, which slopes down. Two dowels at the low point keep your pillow from sliding of. Just take apart for flat storage and ease of transporting it. Made from MDF board. 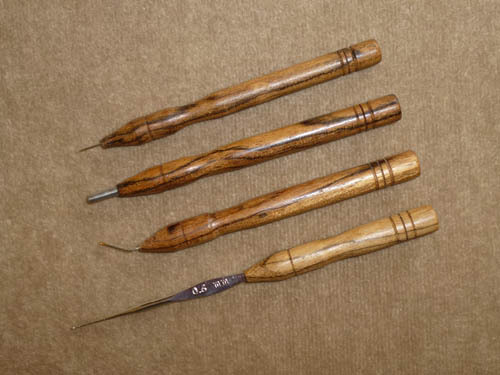 Three tools in one: crochet hook 0.6 (suitable for most lace varieties) or 0.4mm (for Honiton lace) at one end, with a pin pusher/puller at the other. 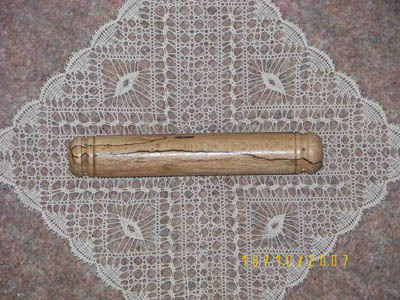 Has a central hole to pin the tool to your lace pillow. Please specify size of chrochet hook. 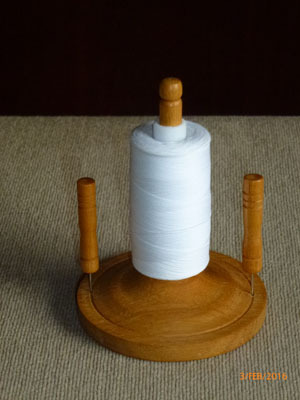 A holder for your thread whilst winding your lace bobbins. The base has a diameter of approx. 7cm, and two holes to secure it to your lace pillow or similar. Quality screw parts mean you can separate the base and stick for storage. Comes with two divider pins to pin to your lace pillow.